If you haven't checked out the new Occasions mini, I highly recommend it. I love everything in it. It's been out since Jan 4 and will be ending April 30. Don't wait, you know how time flies. Before I close, I want to tell you how much your comments mean to me. I really look forward to your comments. So don't be shy. Hasta manana. God bless the rest of your Truly Terrific Thursday. Just beautiful Gloria! This is one of my favorite stamp sets. She will love it! This is beautiful, love how you used the new EF to frame it. Lovely. So pretty Gloria! Thank you for sharing, I love how elegant it is. Beautifully designed! Sure to be loved! Gloria, great use of the tulip folder and the vintage vogue stamp set! 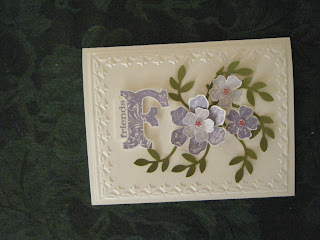 Very pretty, I love that embossed border and always love a "friend themed" card. Beautiful work.